MG did a little research. She wanted to eat someplace new for dinner. 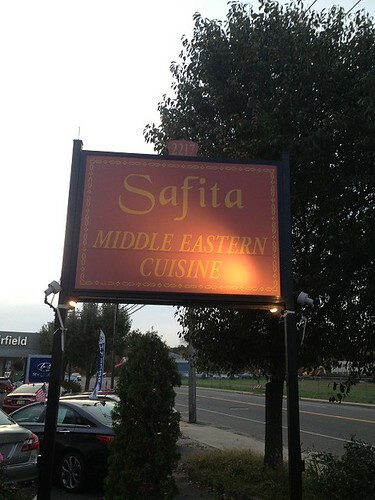 One of her choices was Safita. We looked up some reviews, and they were all overwhelmingly positive. Patrons even suggested a few dishes as especially great. 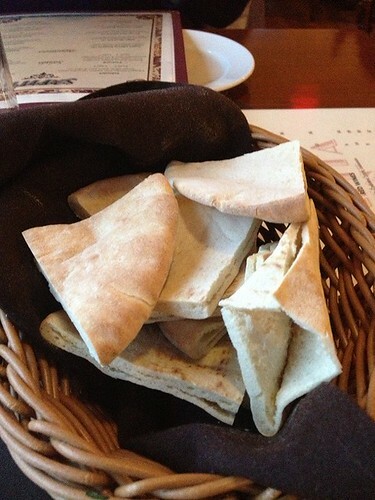 Being a Middle Eastern restaurant, instead of complimentary bread, MG and I received complimentary Pita. 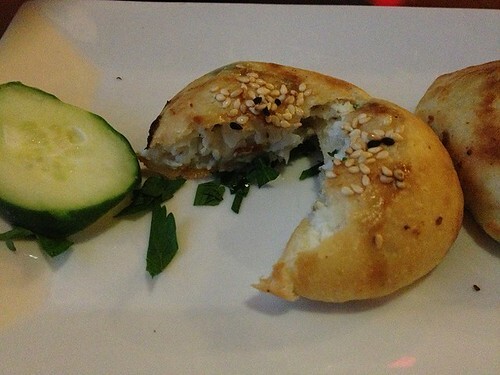 There was nothing special about the pita itself, but the stuff that would accompany it was intriguing. Two of the three are pretty self-explanatory. First, there are olives, which I never touch. 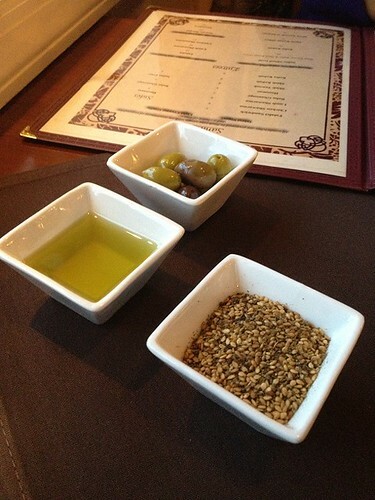 Second, Olive Oil, which I don’t like dipping bread into, and the third dish. This third dish was explained to us by our very friendly waitress. It is a mixture of salt, pepper, and sumac. (I hope I am remembering all these ingredients correctly.) Dip the pita into the oil, then dip into the spice mixture. 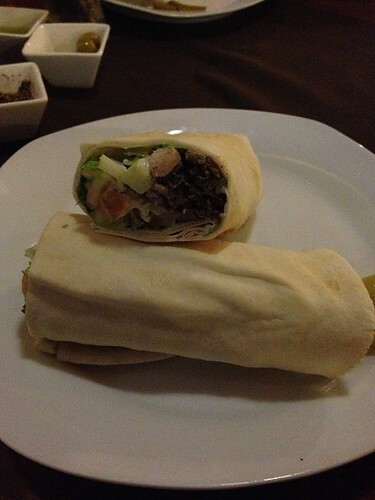 …and there your have a bit of pita post dip. It was a little spicy from the pepper, but the other spices mellowed out the heat. Did I like it? I’m not sure. 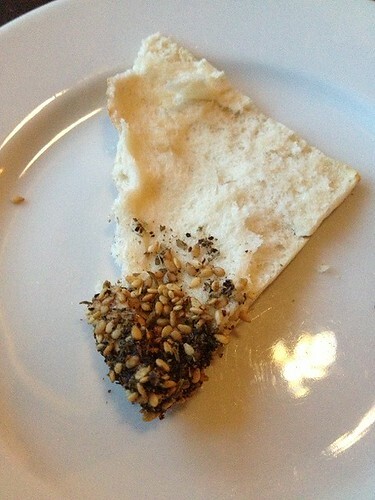 It was definitely different and far more interesting that pita dipped in olive oil alone. MG loved it. One dish that was highly recommended in review after review was the Cheese Fatayer ($7). 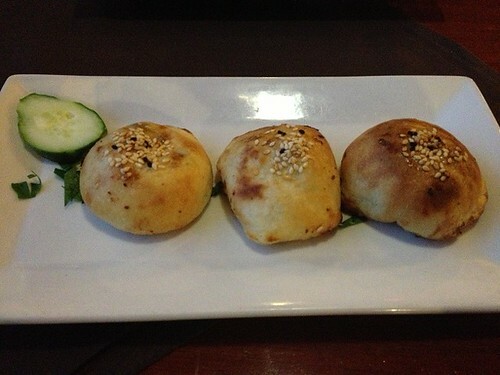 They are described as “Dough stuffed with Syrian cheeses, baked & rolled in sesame seeds”. Take a look at the inside. If I had to compare it to something, I would say it was almost like an undercooked focaccia bread stuffed with a skim milk mozzarella. That description just really gives you an idea of the texture. The flavor was something far more complex. The cheese was like a cross between mozzarella, cottage cheese, and Swiss. There was some saltiness, some tang, some other stuff that I can’t really describe. It was really incredible. I can’t recommend this dish enough. It is very unique and very tasty. Each bite yields a new flavor. Count it as a must-order. 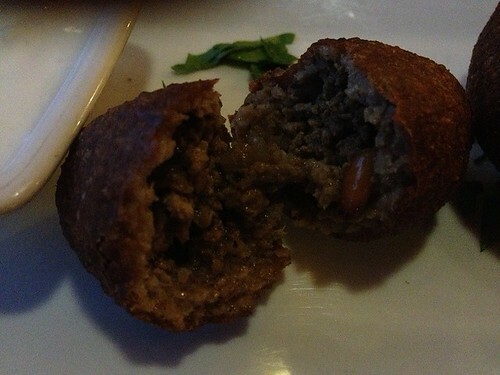 The Meat Kibbeh ($8) is listed as “Fried cracked wheat shell, stuffed with ground beef, onions, & Pine nuts”. The accompanying sauce has a yogurt base, something akin to a tzadiki. As you can tell, the wheat acts like the shell of an egg. The meat inside is not overwhelmed with pine nuts. 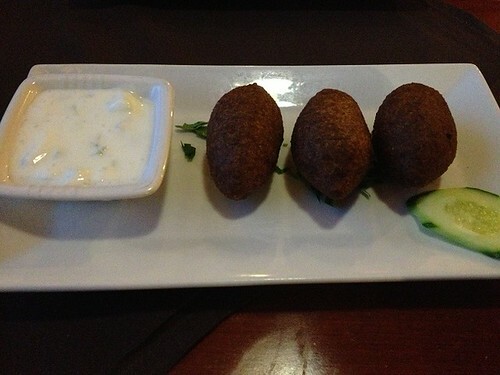 This appetizer was nice, but nothing exceptional. The accompanying sauce didn’t do much to elevate the flavor of the dish. It is not bad, but not a “must-order”. Get another order of the Cheese Fatayer instead. Check out those fries. They are fries, just in potato chip-eqsue format. I loved them. They are perfectly cooked, with a nice crisp outer shell and soft innards. 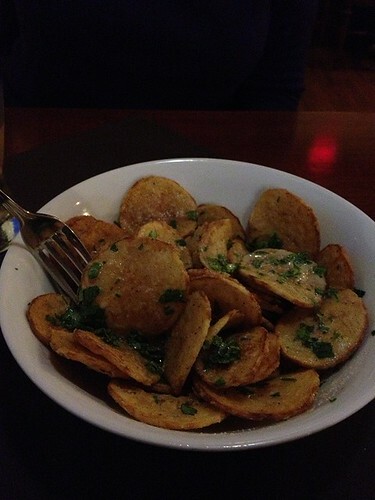 The fries are topped with herbs, spices, and something vinegar based. I could not get enough of them. MG was not as fond as I, since she is not a fan of salt and vinegar chips. However, if you like a little tang with your fried potato, this is the dish for you. For my main course, I got the Lamb Schwarma sandwich ($9). It was nice, but not much more. The lamb was well cooked and well seasoned, but it did not curl my toes. The meat is shredded pretty thin. I would have preferred it a little thicker. It might have given me more lamby flavor. I had a choice of Tahini Yogurt or Creamy Garlic and went with the Tahini Yogurt. It too was fine, but did not impress. What I did really like was the pita wrap. 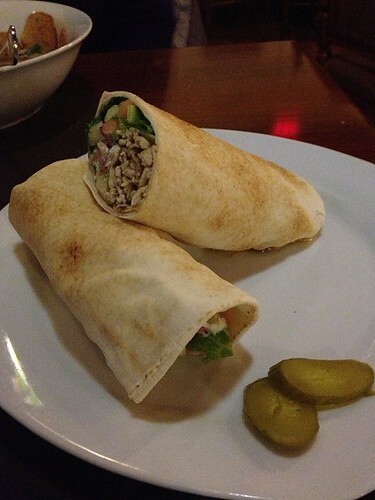 It looks like a flour tortilla wrap, but it is definitely pita. The accompanying pickles were also nice, a great mix of sweet and sour. MG loved her Chicken Schwarma sandwich ($9) topped with Creamy Garlic. She was raving about it throughout the entire meal. I tried it and thought it was nice, but once again, I was not overwhelmed. MG and I will definitely be venturing to Safita again. While I will probably skip the Schwarma on my next visit, I might try one of their specials. On the evening we went, they were featuring some sort of Sea Bass that sounded pretty good, but alas, I was in the mood for lamb. Nevertheless, though my entree didn’t bowl me over, I was very impressed with the appetizers, and the friendliness of the staff. Any longtime reader of this blog knows that I am a big believer in doing what you do well. If you have a very large menu, ensure that you don’t have any throwaway items. Nothing should be added to the menu just for the sake of having it on the menu. Do everything you do well. 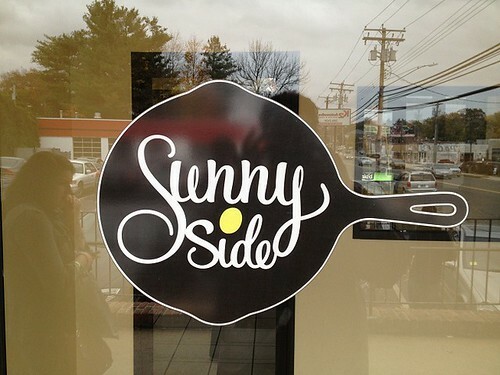 The occasion of this review was my third visit to Sunny Side. The first time I went was only a short time after their opening. It was a Sunday morning, and the place was hopping. MG and I had to wait a few minutes, but were able to get seats at the counter. 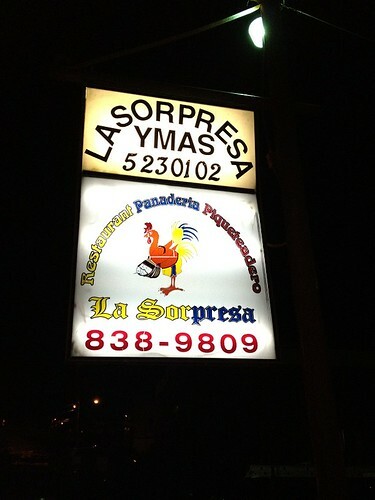 The food was good, the service was great, the prices were reasonable, and the décor was pleasant. Everything seemed to be in place for a return visit. The next time MG and I returned was a weekday. We were there around 10am. This time, we were able to grab a seat at one of the tables. There was no wait. However, this time, it took a little while for us to get our food. “OK,” I thought. “It’s a weekday. Maybe they have a new cook. Perhaps they are working with a skeleton shift.” The waitress even apologized for the wait. “No problem,” I replied. An apology goes a long way with me. What she said next caused me to pause, “We’re really swamped today.” I took a look around, and the restaurant was only at around half capacity. Heck, the restaurant was not crowded, packed, jammed, or even full. I just let it slide. I didn’t look inside the kitchen, so I don’t know how that was staffed. MG & I were seated pretty quickly as we were willing to take two seats at the end of the counter. Our area was wiped off, and two mats were placed before us. A waitress came by quickly and took our drink order. One coffee. One tea. Enter the first issue: I had to ask to get some flatware to stir accoutrements into my coffee. 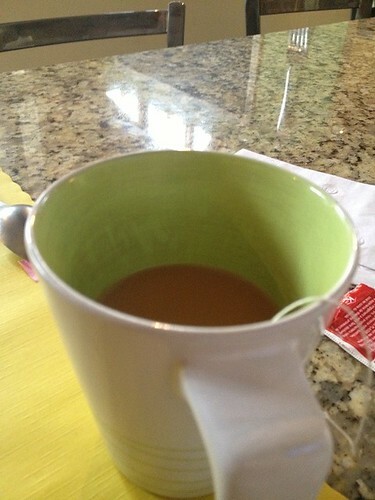 MG assures me that such staining is normal for cups after a while. What do you think? At the half hour mark (Pause for emphasis), Yes, the Half Hour Mark (I think the capitalization helps), when I had only had my initial cup of coffee (no refill), MG was done nursing her tea, and we had confirmed that we had been there A HALF HOUR, MG got the ear of our waitress. YOU ARE A PLACE THAT SERVES BREAKFAST ON A SUNDAY! YOUR ESTABLISHMENT SITS NEAR NOT ONE, BUT TWO HOUSES OF WORSHIP!! YOU ARE LOCATED ON ROUTE ONE!!! YOU’RE SUPPOSED TO BE SWAMPED ON SUNDAY!!!! YOU OPENED A BREAKFAST SHOP WITH THE PURPOSE OF BEING SWAMPED EVERY SUNDAY!!!!! WHEN THE SUNDAY CROWD COMES YOU SHOULD HEAR THE SOUND OF A CLOSING CASH REGISTER IN YOUR HEAD, SEE THE FLOATING OF SILVER COINS WHEN YOU CLOSE YOUR EYES, AND FEEL MONEY IN WADS PACKING YOUR POCKET!!!!!! MG insists that the problem lay in the kitchen. She may be correct. It seems that they have enough wait staff. I don’t know. I do know that Sunny Side has a serious problem that they need to address. If this keeps up, they won’t have to worry about Sunday crowds (or any other day) anymore. I’m a big fan of eating at restaurants off the beaten path. I’m a big fan of the places that have a regular clientele that have a “usual”, a “favorite”, and a “sometimes” dish. I like places that are small, possibly family run, and clean. I dig the joints that are off the beaten path, sometimes in the bad neighborhood, but are popular with the locals. I like places where nobody is speaking English. La Sorpresa meets many of these requirements. They are not located on the main drag in Norwalk. The television has soccer, not baseball, and the broadcasters are not speaking English. The clientele are not speaking English. The staff barely speaks English. The menu is not in English. The parking lot is filled with vans that are from some form of manual labor business, be it landscaping, plumbing, or carpentry. Most of the customers are having drinks to wind down from the week and when they dig into their plates, it’s with gusto. All signs are pointing to success. The interior is divided into two sections, bar and dining. The décor is… well… I don’t really know much about interior design terms, so I guess I would describe it as IKEA’s version of an adobe hut. Not sure if that does it for you, but it was clean, not too garish, and not too tight in terms of spacing between tables. The cuisine is listed as Colombian. I don’t know how authentic it is, but take a look at what follows. MG & I started with some appetizers. 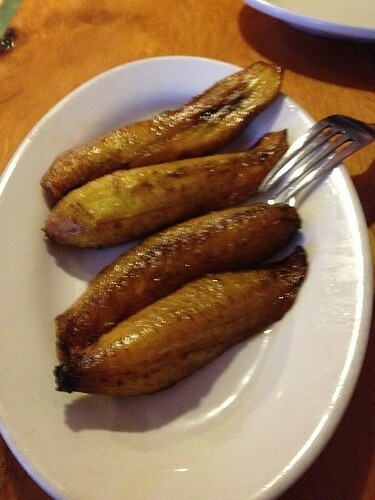 First off was MG’s favorite, ordered anytime it is available, plantains, maduros ($2.00) specifically. These were soft and fried well, not as crisp on the edges as MG really likes, but well cooked with just enough firmness to hold it together. The fried Casava/Yucca ($2.00) was really impressive. 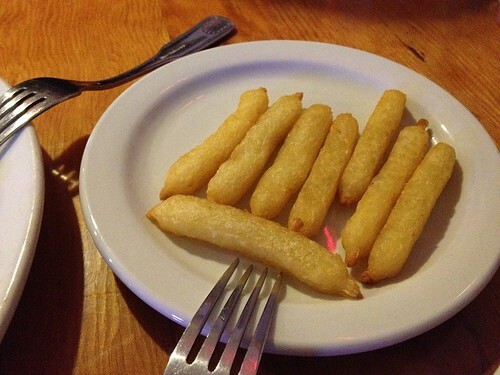 This was one of the first times I’ve ever had Yucca that was fried to this dark a shade, and though I use the description often, this really did taste like a french fry on steroids. I don’t know if they poached, boiled, or blanched the Casava before frying, but this offering had a crisp outside and a soft, almost mashed inside. They were really wonderful. I could go for a basket of these during a football game. Excellent. There were many different options for Arepas, but I opted for plain ($1.00). I should have gotten something else. These were room temperature and very dull. 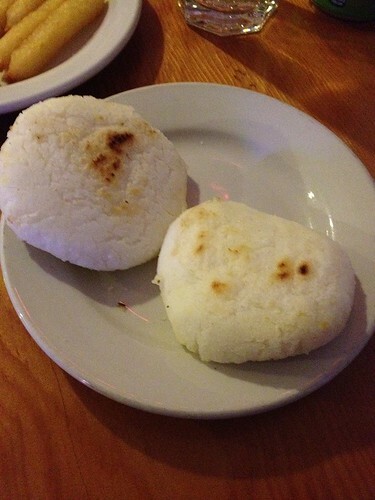 They were starchy and filled with corny goodness, but were not something I would order again. 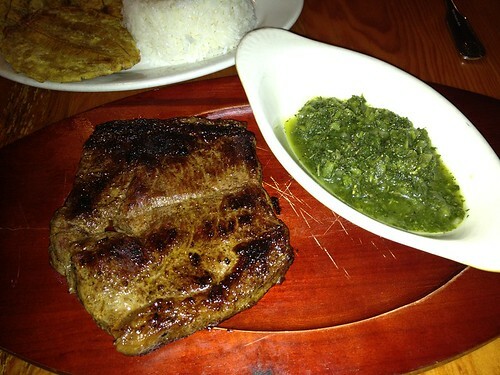 I’m not sure which cut of meat the Churrasco ($17.00) is made from, but I believe it is skirt steak (taken from the inside of the rib). It is tender with enough fat to make for a succulent flavor, but lean enough to have a very meaty texture. The accompanying sauce is a mixture that tastes like mint, garlic, and olive oil. I won’t say that those are definitely the ingredients, but that is what came to mind. 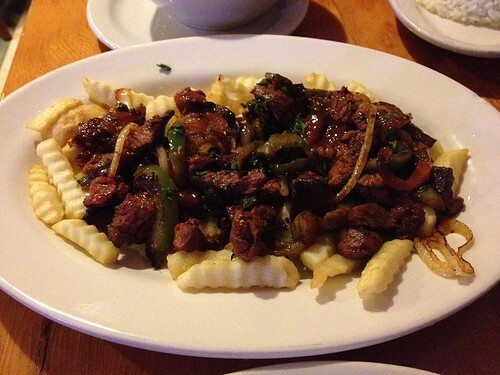 The steak itself would have been nice, but the accompanying sauce put it over the top. Excellent. This is a MUST order. Adjoining my steak were tostones, beans and rice. 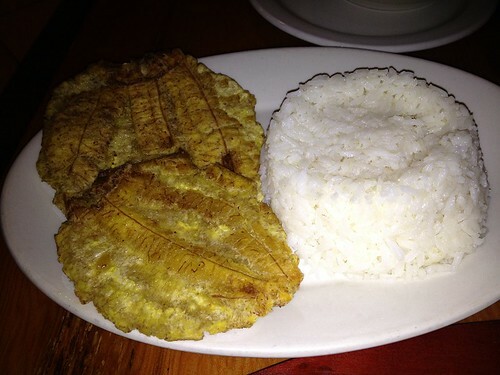 The tostones were awesome. They had a crispy exterior, but yielded to a soft inside. Wonderful. The beans and rice were beans and rice. Nothing to go crazy over, but well prepared and a good compliment to the protein. 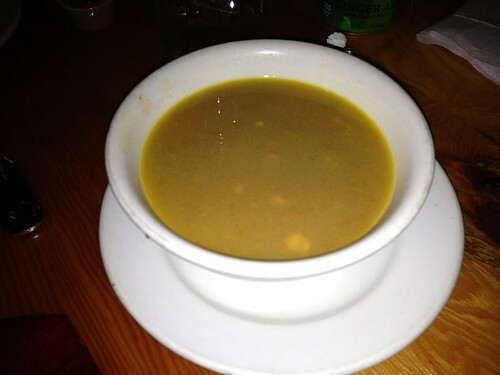 MG got a dish that was basically a steak stew served over french fries ($14.00). Sorry, I forgot to write down the real name, but don’t worry, you’ll find it on the menu. It was pretty good. The meat was very lean and well seasoned. The fries could have used a minute or two more in the hot oil to give it a little more crisp, but they were still tasty. The bar section gets going after 5pm and plenty of people are there watching soccer. Drop in a for a bite and a drink. When throwing a party for 30 or more people, what to serve is a headache that most people do not want to deal with, hence the existence of caterers. However, depending on the size of your kitchen and dining space, your options may become limited. 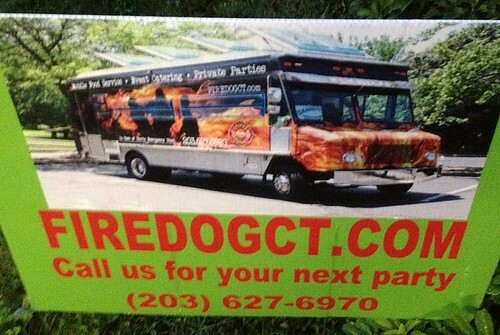 If you have a big driveway, the Firedog Truck of CT is an option. They bring the kitchen. They bring the disposable plates. They bring the condiments. Everyone just walks up to the window and orders what they want. 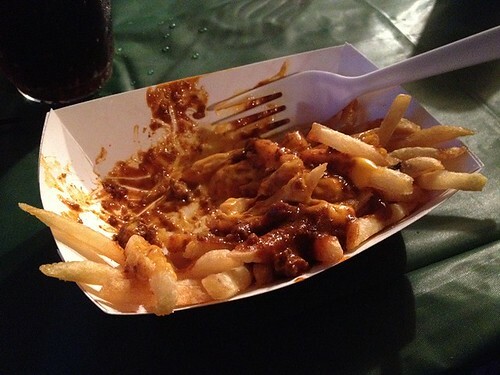 If it is available, MG is having the Chili Cheese Fries. This was not spicy chili, but it was not bland or under-seasoned. It was quite good, sans heat, which many guests were very pleased about. The fries were crispy and the cheese, though not high quality, was plentiful. In all honesty, is high end cheese really needed for chili cheese fries? The Red Hots are excellent. There was just a little char, and the bun was soft. One of the signs alongside the truck advertise that they use Sarabett Hot Dogs. If you find this truck at any sort of event, definitely opt for the red hot. 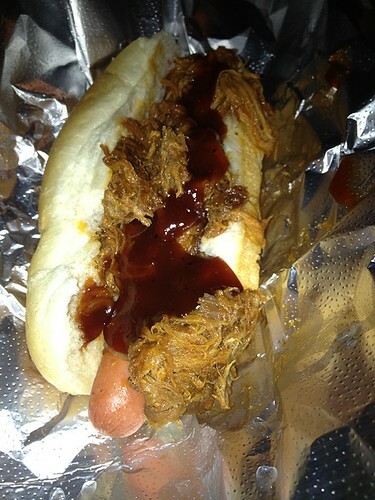 Dream Dog: a hot dog topped with pulled pork and served on bun. 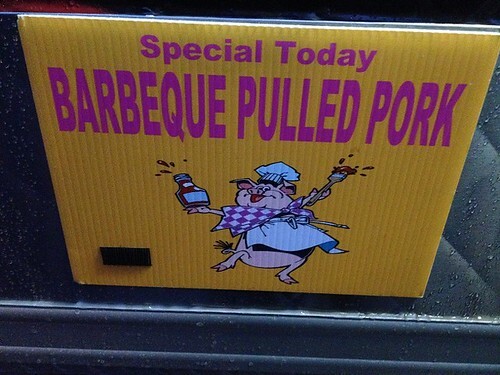 The pulled pork is nice, but it lacked the vinegar kick that many search for when eating the dish. 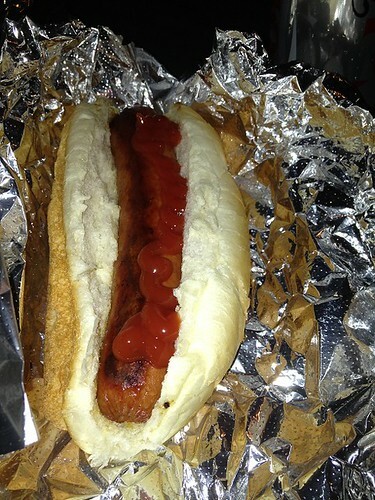 The hot dog is nice, but overwhelmed by its swiney neighbor. The red hot might have been a better delivery system for this bizarre concoction, but I was full. Though not pictured, I also tried their grilled chicken. Served on a fluffy Portuguese roll, it was properly charred, meaty, well seasoned, and delicious. They do grilled chicken right, if you are so inclined. Another specialty item they offered was called “Elvis’ Last Call”. It was a bacon burger topped with peanut butter. I did not partake of this abomination. The reviews were mixed, as should be expected for a mixture of pork, beef, and peanuts. Needless to say, it shows that the folks at the Firedog Truck are willing to mix and match whatever they have available to your liking. Were I not full, a red hot with chili and cheese would have been pretty awesome. I spoke with the owner, and he says that he and his partner (I assume his wife) have been running the truck for two years. Though they generally do corporate events and private parties, they are also at festivals and concerts. Check their website and twitter for their availability. July 4 is the time for cookouts and barbeque, but I wasn’t in the mood for cooking. The next best thing was going out for barbeque. Since everyone was busy traveling to see fireworks or grilling in their yards the restaurants were pretty empty. 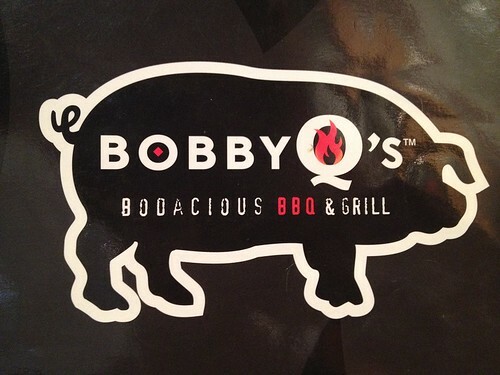 MG and I took in a movie and went to the Westport location of Bobby Q’s. Don’t blink as you drive down Main Street, or you might miss the location. There is a little sign shown above to mark the location. The actually front is down a walkway away from the street. Drive around the back of the main street to find parking. 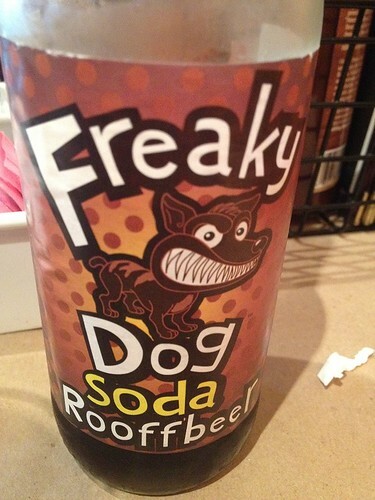 They have Freaky Dog Root Beer and other various sodas. I always like when there are choices other than Coca Cola and Pepsi. The presentation for the Hot Frizzled Onions ($6.99) is pretty awesome. 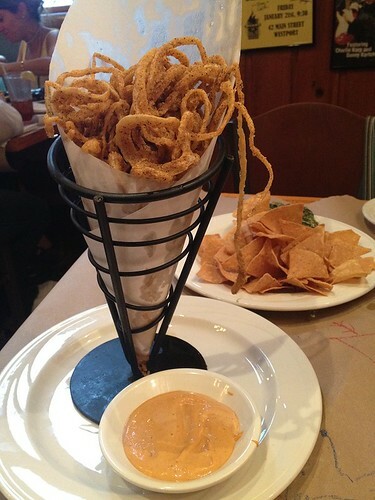 They are crispy and thin strings of lightly breaded onion. Almost impossible to eat by hand, you have to use a fork. The accompanying spicy dipping sauce is a wonderful companion to the fried strips. The only odd thing about the cone is how it allows the oil to drip down into the plate. If you are eating onion rings in the first place, you know that they are not the most health-conscious of dining choices, but seeing a yellow pool in your plate is not very appetizing. 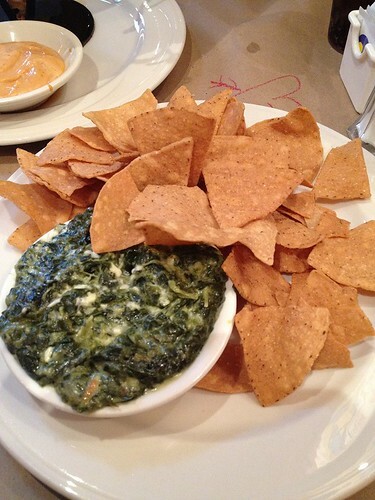 The Warm Spinach Dip($7.99) is plenty spinach, but not much dip. The chips were awful. They didn’t snap or crunch. I’m not sure if they were stale or just lousy. If you have read this blog regularly, you know that when barbeque is on the menu, MG is having brisket. While this remained true for this restaurant visit, she did add a slight twist by getting the Open Faced Brisket Sandwich ($12.99). It is served on Texas Toast with cheese and a side of fries. She opted for the sweet potato fries which were incredible. They were crispy and delicious. 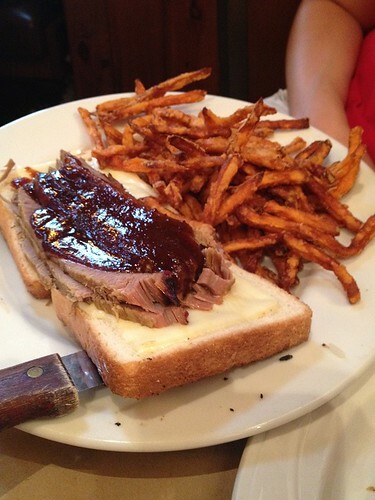 The Texas Toast was nice, but not what I would consider an excellent companion to the brisket. The brisket was tender and tasty, but closer in feel to roast beef than to fall apart beefy, brisket goodness. Alone, the brisket might go with some cornbread very nicely. 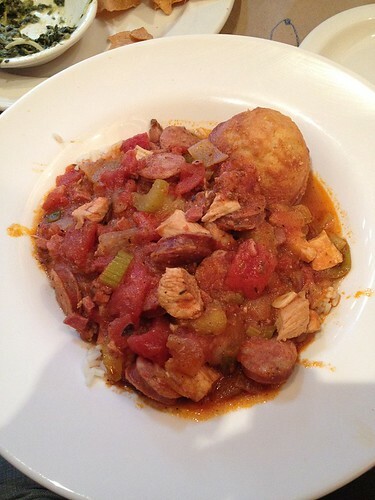 Avoid the Big Easy Jambalaya ($15.99). It is boring. Granted, the restaurant is barbeque, not Cajun, but they should just remove this from the menu. Everything is well cooked, but the dish is flavorless. It’s got ham, sausage, chicken, and no taste whatsoever. 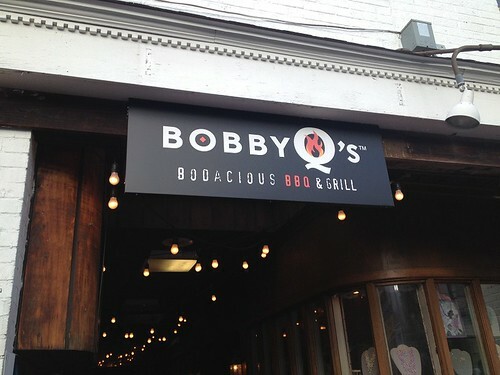 I would try Bobby Q’s again, but would give the ribs a shot. Other tables were ordering full and half racks. They smelled excellent.